They say that eyes are the windows to a person’s soul. But how does that translate for amigurumi? One of the things that I like doing is having an assortment of different eye choices when I’m making a project, just so I can make a decision about what the final look is going to be. I present to you three different eye options: safety eyes, yarn eyes (crocheted/knitted and embroidered) and button eyes. I also include my personal thoughts on them as well as some safety issues you may want to take into consideration. Incredibly popular, safety eyes are most commonly used in commercially produced stuffed animals and can be bought in stores – some general craft stores will carry them, as well as some fabric stores and online websites. Safety eyes have require some assembly – there’s the piece for the eye that has a post and a washer (metal or plastic). What you do is put the post through the piece and then place the washer over the post and push it down the post until it’s all the way down. Safety eyes are very snug and difficult to pull apart. However, a safety concern is that crocheted or knitted fabric can fray or the spaces between the stitches (especially in crochet) can stretch or get larger, allowing the eye (washer and all) to come through, creating a choking hazard for children and pets. One way to remedy this is to use a small piece of felt between the washer and the crocheted/knitted fabric. Safety eyes can be pricey, if you’re purchasing them in pairs, so consider a bulk purchase – this would require you to buy a large amount of eyes in the same size and colour though. So if you’re an occasional amigurumi creator, you might want to consider other eye options as this would be an expensive option for you. 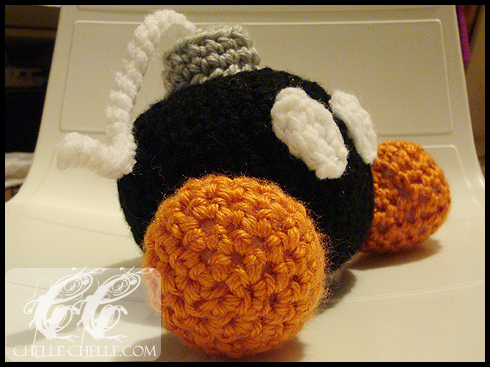 One of my personal favourites for eyes is to crochet a circle or oval and then sew it onto the face of the amigurumi project. Another thing you can do is use a tapestry needle and embroider the eye onto the face, embroidering slightly slanted eyes or upside-down U shapes make them look like they’re sleeping, a very cute expression. The great thing about yarn eyes is that they are (for the most part) child-safe. I sew them tightly onto the face of my amigurumi and then, I knot them several times on the inside of the head. If I know that it is going to be gifted to a child or an infant, I dab glue to the knots and allow for them to dry in an effort to ensure that the knots do not come loose. 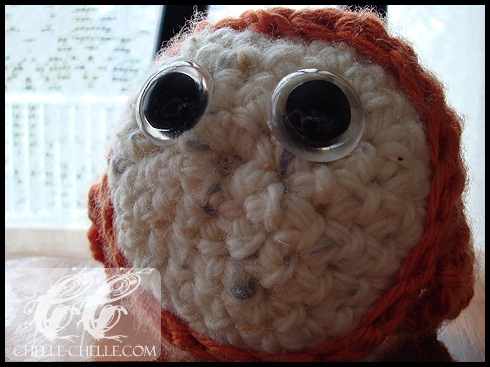 Yarn eyes are also a great way to use up any leftover yarn that you have from previous projects, making it one of the more inexpensive options. An alternative to yarn, which can also be used for embroidered eyes or even crocheted/knitted eyes, is embroidery thread/floss. This is fairly inexpensive and there is usually a huge colour selection in most craft stores. I save buttons when they fall off of shirts, or the extra ones that come with new things I’ve bought. I’ve also went ahead and bought bags of mixed buttons at stores before, in hopes of getting some gems to use in projects. What I also like doing is using buttons as eyes. You can match them up and choose two identical buttons or make it a little different and choose two buttons that are different sizes or colours. Button eyes change the expression on the face of a stuffie and they remind me a lot of some of the older toys – think rag dolls with button eyes. However, a word of caution, I do not recommend using button eyes on amigurumi if you know it will be going to an infant or a small child. Buttons, no matter how secure you may think they are, can get loose and are choking hazard. Button eyes can be very cute, but they are not very safe (at all) for toys that are going to children. Some other popular eye options that will be discussed in Amigurumi: Choosing Eyes – Part 2 will be plastic googly eyes, bead eyes and felt eyes.